I think periodically on Saturdays I'm going to share some links with you to posts elsewhere that I really enjoyed, as well as some funny stuff I run across in my Reader during the week. Enjoy! Laura at Hollywood Housewife shared her journey of faith in several parts this week, beginning in childhood and working her way up to today. I loved her honesty and respectfulness as she told her story. Start here. Ten piglets were born to one mama this week. Oh my heavens, they are so cute they made me smile. Click here to see more pictures. If I ever posted this status on Facebook, this is exactly the kind of response I would get from my friends. And I'd love them for it. LOL at the Michael Jackson comment! A big raucous laugh can be heard from my sewing room at the moment. SO funny. 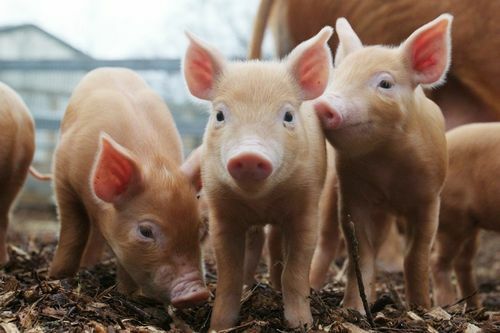 I can still eat pork chops after seeing the cute piglets. 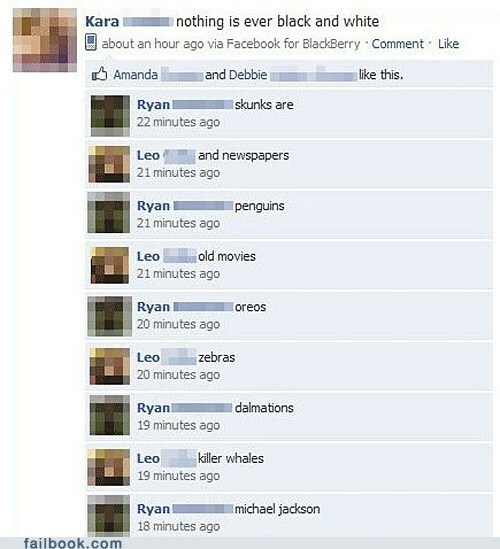 I was enjoying the black and white comments but adding Michael Jackson cracked me up. I was laughing all the way through - but really got the giggle at the MJ comment!